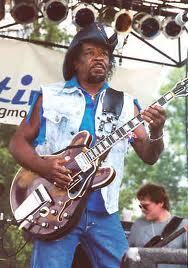 Eddie King, Chicago blues guitar player passed away on March 14, 2012. He was 73. He played with many of the greats, including Muddy Waters and Howlin’ Wolf. He is best known as both a solo artist and as the backing guitar player for Koko Taylor. He played with Koko for 20 years. The video attached is Eddie with his band “The Swamp Bees”. There is a short interview then some very good live blues. This entry was posted in Blues, Music History, Remembering and tagged Blues, Music. Bookmark the permalink.